We petition you to enact legislation to ban all new investment in projects that contribute to global warming. Bans should apply immediately where safe alternatives are already available. Climate impacts are already killing people and destroying ecosystems. Every new climate-damaging project that is approved puts us all in even greater peril and makes recovery even harder. It is a failure of a parliamentarian’s duty of care to encourage or allow new projects that increase the risk of disastrous climate impacts. We all deserve better. As a first step, this ‘no more bad investment’ legislation should ban all new coal, oil, and gas projects and all new logging or clearing that degrades and destroys natural carbon sinks (including renewals of expiring regional forest agreements). No new fossil fuel exploration or extraction projects. No new fossil fuel infrastructure projects. No new wood biomass power generation. The resultant market certainty would facilitate the rapid roll-out of climate-safe alternatives in sectors such as the electricity sector where safe alternatives are already available, and underpin efforts to develop affordable climate-safe alternatives in sectors where an immediate ban is not yet practical. There is no need to put our people and ecosystems at greater risk by allowing investment in climate-damaging projects. We can power our state without sacrificing our future. 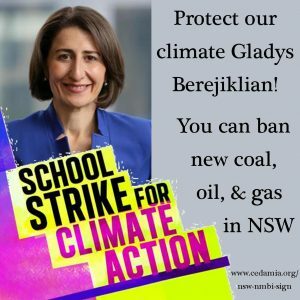 Please sign this petition regardless of whether you live in NSW or not. Anything the NSW government does that affects climate will affect everyone in all parts of Australia, and indeed anywhere in the world. After you sign, please use the links below to invite your friends to sign too. Click to share on Facebook. Click to share on Twitter. See the NSW NMBI Action Kit if you’d like to help build this campaign in NSW. This petition to the NSW state parliament focuses on just one component of the Climate Emergency Declaration and Mobilisation program called for in our petition to all levels of government in Australia. State governments have the power to ban specific types of projects within their own state, so successful campaigns to have state/territory governments ban climate-damaging projects would achieve one of the aims of the nation-wide climate emergency mobilisation campaign. Model ‘No More Bad Investments’ legislation drafted by Environmental Justice Australia and Philip Sutton can be downloaded here. If you’ve not yet done so, please consider also signing the climate emergency declaration petition to all levels of government at cedamia.org/sign. Click the image below to view the GIF and share on Facebook. Click the image below to view and share the post on Facebook. The fossil fuel exports petition uses a different signing mechanism to the 9 NMBI petitions below, so please sign it separately at Ban new fossil fuel exports petition. 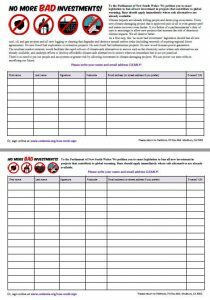 You can sign individual NMBI petitions at the links below, or, if you’d like to sign all 9 below via a single form, click here.